In late summer, one of my coworkers, Adam Turer, walked up to my desk looking like the cat who ate the canary. "What?" I replied, looking up from connecting the dots on a chain of assignments and merger documents. "Adam Richman is coming. Here. Izzy's. For me!" And Adam and I kept our mouths shut about the show until it became public knowledge that Adam Richman was coming. Even when the media speculated about where he was headed, both of us just giggled quietly in our cubicles. It was tough. Adam was nice enough to have lunch with me the other day and answer a few questions about the show. He also let me take pictures of his food. Thanks Adam! 1. Did you learn anything useful about your first attempt at the Reuben during your audition video? What was your strategy going in? I took a different approach in my first attempt. I ate all the insides (meat, cheese, sauerkraut) first, then attacked the massive amount of bread and potato. I put down the innards of the sandwich, but couldn’t get through all the starch. I finished just over 3 of the 5.5 pounds in that first attempt. That was with basically no training. In my second attempt, and after talking to Adam and local competitive eater Joe LaRue, I stuffed myself at a Golden Corral 2 days prior, and I went at the 110 like a regular sandwich for the challenge. It tasted much better that way and the potato pancake on the sandwich tasted great. I cut the sandwich into eighths and went at it one slice at a time. 2. What’s Adam Richman like in person? Adam is one of the sweetest, most genuine guys I’ve met. He really, really cares about his show and the people involved in making it. He called me as soon as we were done filming background shots with my son’s baseball team the night before the challenge to make sure all the kids and parents had a good time and to apologize for the amount of time it took. He signed autographs for the kids and his crew played sandlot baseball with me and my boy one day after we were done filming. At the end of a 16-hour day of filming, Adam’s still cracking jokes and making everyone in the room enjoy themselves. He works extremely hard to put out the highest-quality product in each episode. 3. Can you tell us anything about the episode that we might not know (without giving anything away, of course)? I had no idea how much work goes into filming a 23-minute episode of television. The crew spent almost every hour of four straight days filming all over the city. I was exhausted and I was only involved in about 15 hours of it. I have not seen the episode yet, so I’m not sure exactly what made the cut. I know that a lot of hard work went into it by all involved. 4. What was the hardest part of the challenge? The time limit. I’ve seen every episode of Man vs Food and Man vs Food Nation and there are not many challenges shorter than 30 minutes, except for the spicy challenges. A quantity challenge like this in half an hour is the biggest obstacle. There really isn’t time to get that second wind and rally in the closing minutes. You have to start and go full speed ahead for all 30 minutes. I think 45 minutes or an hour would be more appropriate for this challenge. 5. Do you still like eating Reubens? Yes. I still go to Izzy’s about once a week. This experience did entice me to expand upon my usual menu choices, though. I needed to try some different things other than the reuben for a while. That’s one of the great things about Izzy’s; the reubens are the best, but there’s a lot more on the menu. I really like the Mex and the Codfather. I'm pretty excited to see the episode, which airs Wednesday the 12th at 9 PM on the travel channel. Don't miss it! And no, I don't know who won. Adam's been impossible to crack. Last month, David and I joined bloggers from across the country for a mini vacation in Columbus. Over 3 days, we ate, drank and visited more food and drink related establishments than I thought possible. We were thrilled when we were first contacted by Experience Columbus a few weeks prior to our trip, offering to take us on a magical, all expenses paid journey through their city. It makes the most sense to go in chronological order, post wise, and we have a lot of pictures. Seriously, you have no idea. It took me over 6 hours to edit them all, partly complicated by the fact that editing food pictures is very hungry work and you need to keep stopping for snacks. 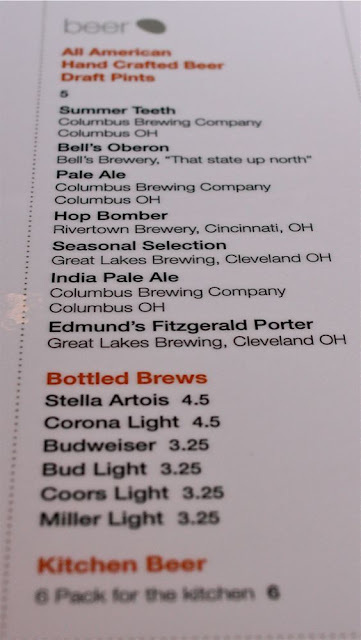 We hope that you enjoy our posts about Columbus as much as we enjoyed our visit. 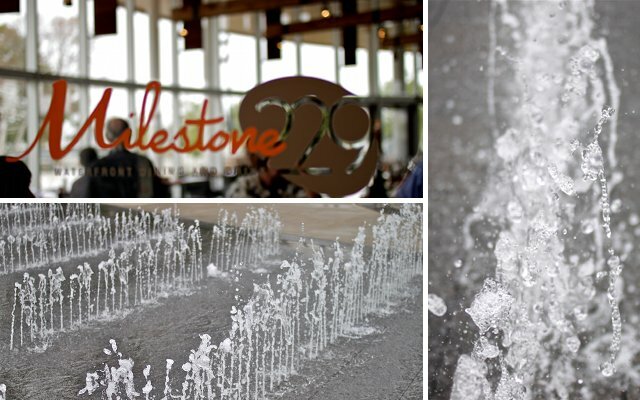 Our first stop when we arrived in Columbus was Milestone 229, a contemporary restaurant overlooking the newly built Bicentennial park. The restaurant and the park were very impressive, and it was a great way to start out our trip. 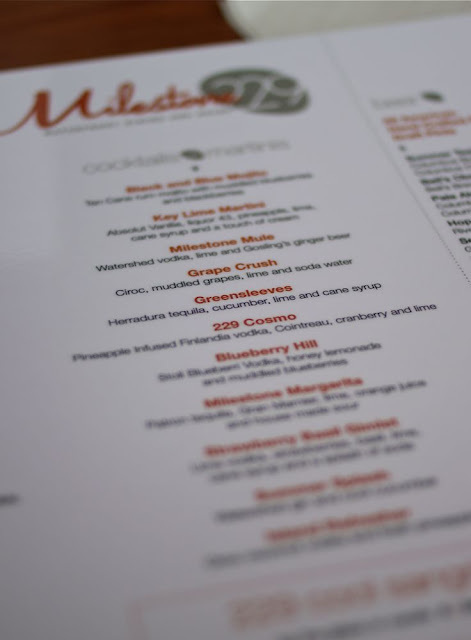 After meeting our fellow bloggers and everyone furiously exchanging business cards, we settled in for a drink and a sampling of the menu at Milestone 229. Both my cocktail, named “the greensleeves”, and the all dishes we tried were excellent, as well as creatively presented. And...out come all the cameras! These are the other fine bloggers we had the pleasure of meeting on our trip. I also got to catch up with Julie of Wine Me, Dine Me, who I hadn't seen all summer!